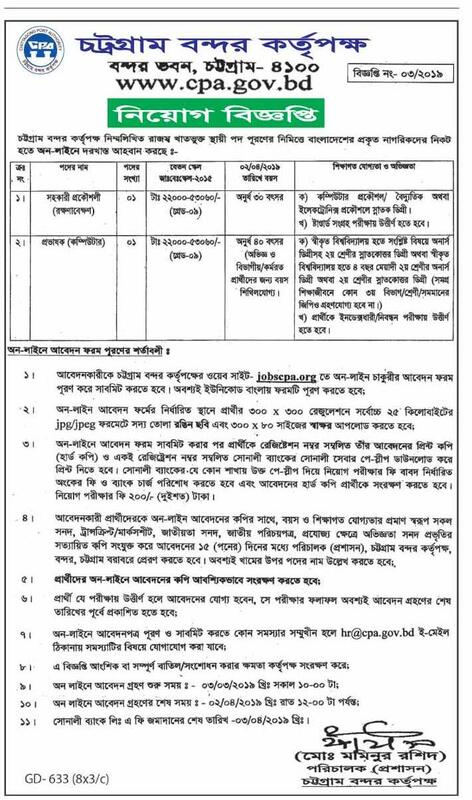 Chittagong port authority CPA job circular 2019 has been published. Chittagong port authority job resignation are many category. It’s a huge opportunity to unemployed people Who want to do in this sector. Chittagong port authority is the most valuable part in our country. Chittagong port authority is the most popular zone in Bangladesh. With the job chances in Chittagong port authority,anyone can take this opportunity. Chittagong port authority offer to people for exciting career opportunities in port sector. Chittagong port authority think that young and energetic people is the key to success in this sector that create brightness in our country. Otherwise,Chittagong port authority help’s us to social economy. Institute Name : Chittagong Port Authority. I am a regular visitor to your job information site. But I can not see a advertisement number in this ad. I am will be Benefits if you notified by notification number.